Do I ever have a fabulous product to share with you today! 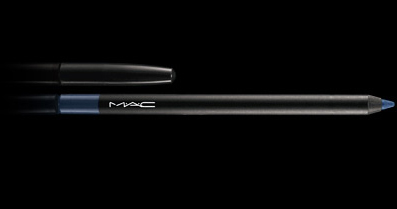 I've had M.A.C Pearlglide Intense Eye Liner sitting in my stash for quite awhile. I kept thinking about breaking it out, but then I wouldn't line my eyes for the day (gasp!) or I would worry that it would be too heavy. Well, color me impressed -- because this is definitely my new favorite eyeliner. Pearlglide really does glide onto the eyelids. I've never found a liner that creates such an intense, precise line in such little work! You almost feel like the liner is doing the work for you. It's absolutely amazing to watch! And the colors? So gorgeous. I'm favoring Petrol Blue, a deep navy with greyish undertones, that really makes my brown peepers pop. Precisely lined eyes are just moments away! M.A.C Pearlglide Intense Eye Liner retails for $14.50.